Shannon Ratzlaff’s new book “The Journal” is a historic and captivating story of love, loss and the pursuit of happiness. Recent release “The Journal” from Page Publishing author Shannon Ratzlaff is both telling and emotional; this work depicts the life of a newly widowed woman as she decides to search for her true self and understand the mysteries of life. Shannon Ratzlaff, a mother, wife, animal lover, history buff, devoted writer and author, has completed her new book “The Journal”: a gripping and potent story of inspiration and acceptance. This work delves into the idea of self-identity, love, forgiveness and acceptance. Published by New York City-based Page Publishing, Shannon Ratzlaff’s entrancing story opens the window to a life unknown and a plethora of forgotten secrets. It’s 1869 in Sedillo, New Mexico, and nineteen-year-old Maggie Brand has just buried her husband, J. R. Married four years to a brute of a man, she is finally free to move on and make a new life. First, she must sell his cattle. Maggie shares her deepest thoughts in her journal as she rides along on a cattle drive into an unforeseeable future. Tristan Montgomery, one of her drovers, has an eye for the red-headed beauty. He’s determined to get her affections and return home with her as his wife. Life after her husband turns out very different from expected as her forgotten childhood haunts her, her life with J. R. has scarred her, unexpected secrets change everything, and an unknown enemy is out to get her. Her journal becomes her best friend as she searches for a treasure that will define her and reaches devastating conclusions when all seems lost. Will Maggie ever finally find the happiness she seeks? Join Maggie as she discovers life, what makes people who we they are, and what it takes for them to cross the line between right and wrong. 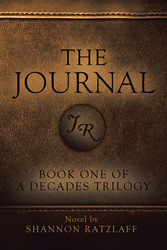 The Journal is the first book in A Decades Trilogy. It’s a historical fiction novel filled with intrigue, mystery, love, secrets, and soul-searching that will keep readers turning the pages until the unbelievable end. Readers who wish to experience this enthralling work can purchase“The Journal” at bookstores everywhere, or online at the Apple iTunes store, Kobo, Amazon, Google Play or Barnes and Noble.